BellBrook Labs was recently awarded a $288,000 SBIR Phase I grant from the National Institutes of General Medical Sciences (NIGMS) to develop an HTS assay for cyclic GAMP synthase, an enzyme that triggers immune responses to viruses and tumors. The new assay will be used in an effort to screen for cGAS enzyme modulators as treatments for autoimmune diseases and cancer immunotherapy. Activation of cGAS by cytoplasmic DNA or RNA initiates activation of the innate immune response via induction of Type I IFNs. Madison, WI – June 14, 2017 – The National Institutes of General Medical Sciences (NGMS) has awarded a Phase I $288,000 Small Business Innovative Research (SBIR) grant to BellBrook Labs, LLC for the commercialization of an innovative high throughput screening (HTS) assay for detecting cyclic GMP-AMP(cGAMP) the product of the cGAMP synthase (cGAS) enzyme. cGAS is a novel target shown to have implications in immuno-oncology and autoimmune diseases. 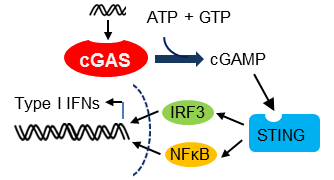 As foreign DNA enters the cell, cGAS detects the DNA and produces cGAMP, which acts as an agonist for the STING (stimulator of interferon genes) receptor to induce a type I interferon response. Researchers have shown that regulating cGAS activity could help control this immune response with therapeutic benefit for interferon-driven autoimmune diseases such as lupus. Progress discovering small molecule cGAS modulators have been slowed by the lack of HTS-compatible assays. BellBrook has leveraged its proprietary Transcreener® platform to directly measure cGAMP in a homogeneous immunoassay format with fluorescent readouts. Direct detection reduces the potential for interference in HTS and allows kinetic methods such as determination of residence times for more effective lead optimization early in discovery. The Transcreener cGAS Assay will enable screening of diverse small molecules for an emerging target in autoimmunity and immuno-oncology, accelerating discovery of first-in-class drugs for debilitating diseases. 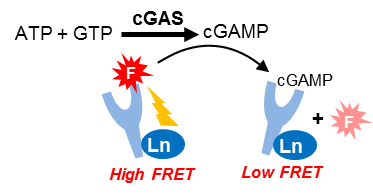 cGAS enzymatic assay based on homogenous TR-FRET immunoassay for cGAMP. BellBrook Labs is dedicated to accelerating drug discovery and biological research by providing innovative high throughput screening solutions. Transcreener® is a universal, homogeneous biochemical assay platform based on detection of nucleotides that makes it easy to screen thousands of different enzymes. These include validated targets like kinases, as well as emerging targets like ATPases, GTPases, methyltransferases, and glycosyltransferases. Detection reagents and drug discovery services from BellBrook Labs help researchers progress toward more effective therapies for cancer and other debilitating diseases. Read more about the Transcreener cGAMP cGAS Assay. Research reported in this publication was supported by the National Institute of General Medical Sciences of the National Institutes of Health under Award Number R43GM123833.The content is solely the responsibility of the authors and does not necessarily represent the official views of the National Institutes of Health.